As you all are well aware that Kyabje Drubwang Pema Norbu Rinpoche, the 3rd Supreme Head of the Ngagyur Nyingma School of Tibetan Buddhism, who had been extraordinarily kind to Buddhism in general and the Nyingma Lineage in particular, passed away into parinirvana according to the common perception of beings on the 1st day of the 2nd Tibetan Month, 2136 Royal Year (27th March, 2009). 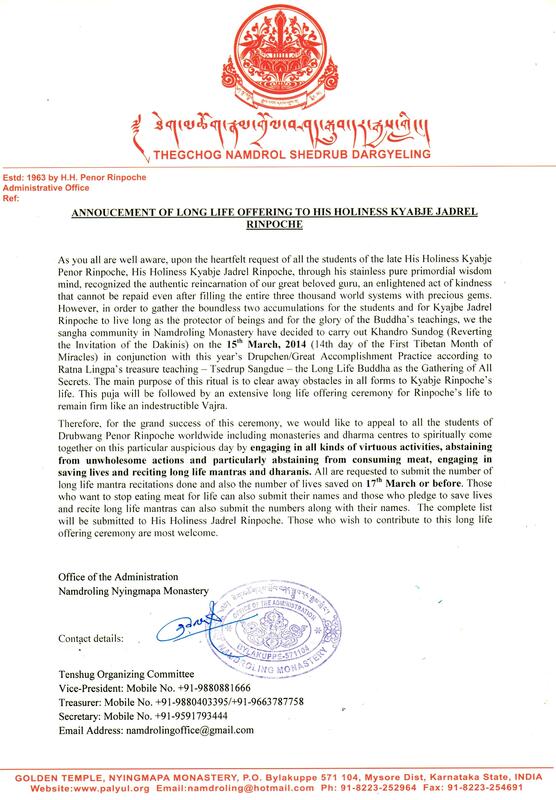 At the request of all his students, Kyabje Pema Norbu Rinpoche’s kudung has been preserved in Namdroling Monastery as a support of their practice and as an object of respect as well as merit accumulation. More than three years have passed by since his passing away during which all the devoted students at home and abroad have prayed for his swift rebirth with great hope and faith. In addition, all the specific prayers prescribed by Kyabje Jadrel Rinpoche had also been perfectly completed without fail. 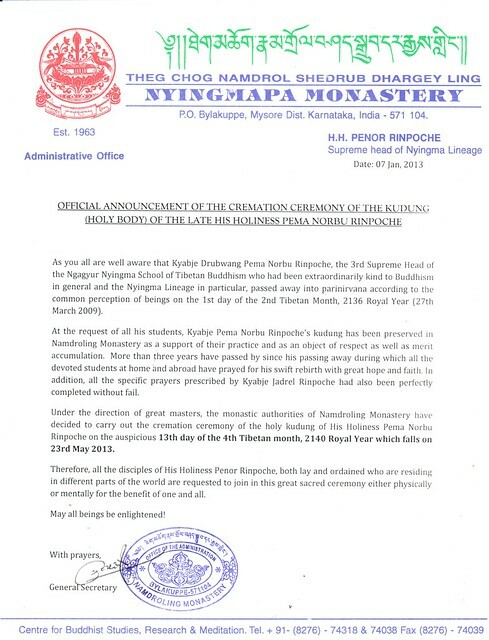 Under the direction of great masters, the monastic authorities of Namdroling Monastery have decided to carry out the cremation ceremony of the holy kudung of His Holiness Pema Norbu Rinpoche on the auspicious 13th day of the 4th Tibetan month, 2140 Royal Year, which falls on 23rd May, 2013. Therefore, all the disciples of His Holiness Penor Rinpoche, both lay and ordained who are residing in different parts of the world are requested to join in this great sacred ceremony either physically or mentally for the benefit of one and all.